The largest diamond ever mined weighed 1.33 pounds, while the tiniest diamonds are only a few atoms across. In between these extremes, diamonds fall into many different sizes. Size is often the first thing people notice about a diamond, and it is included in the 4Cs by which every diamond is graded (The 4Cs are cut, color, clarity, and carat-weight). All of this means that knowing, and making the most of, your memorial diamond’s size is a good first step toward creating a stunning piece of jewelry to memorialize your deceased loved one. However, we often find that customers have many questions when it comes to understanding diamond size. For instance, what makes a diamond big? How should a huge diamond be cut? Are there any colors that work better with a big diamond than others? To help you find answers to these questions, we have put together a guide to big diamonds. 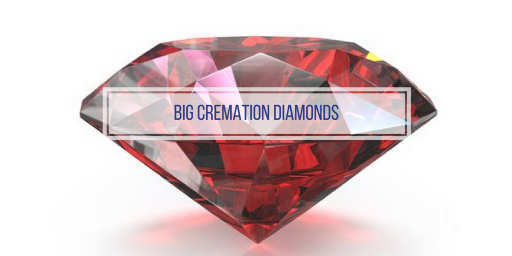 From the definition of a big diamond to a look at the best colors and cuts for this size diamond, this guide will help you to make the most of your large cremation diamonds. Carat-weight is the most common way to determine the size of a diamond. If you are basing your definition of a big memorial diamond on its carat-weight, a big diamond is any diamond over 1 carat. A huge diamond is any diamond over about 2 carats. The gold standard for measuring the size of the diamond is the carat. The term “carat” refers to the weight of the diamond. The word comes from the Arabic term for the carob bean, which was preferred as a standard of weight because every carob bean weighs almost exactly the same. Often, a carat is believed to be an indicator of size. However, in reality, a carat is a measurement of weight equal to .2 grams. Thus, the larger the carat size of a diamond, the heavier it is. Carat is one of the 4Cs of diamond grading, along with cut, color, and clarity, and is, therefore, the most important indicator of the size of a diamond. Small diamonds are those that weigh less than .5 carats. Medium diamonds are those that weigh between .5 and .75 carats. Large diamonds, however, are those that weigh 1 carat or more. If a diamond exceeds 2 carats, it can rightfully be considered a very large diamond, since gem quality diamonds of that size only appear in about 1 out of every 5 million diamonds mined. (Gem quality 3-carat diamonds are even rarer, appearing in only 1 out of every 15 million diamonds mined). While large diamonds are exceptionally rare in nature, you can request a large cremation diamond of up to 2.09 carats from Heart In Diamond. Typically, due to their rarity in nature, the cost of a large diamond goes up exponentially after it exceeds 1 carat in size. The cost of a diamond varies widely due to the quality of its cut, color, and clarity. However, you can expect to pay $5,500 or more for a 1-carat diamond and $17,000 or more for a 2-carat diamond. The size of a diamond may also be measured by the width of its girdle. This outer edge of the diamond influences how suitable the diamond is for jewelry and reflects the quality of the cut the diamond was given. Another way in which diamonds are commonly measured is by their girdle width. The girdle of a diamond is the widest part of the diamond. It sits between the top of the diamond (called the crown) and the bottom of the diamond (called the pavilion). It is measured in terms ranging from Extremely Thin to Extremely Thick. The width of the girdle can affect the quality of the diamond. For example a very thin girdle is prone to chipping when set in jewelry, while a girdle of uneven thickness reflects a bad cut that can negatively impact the amount of light the diamond reflects, the placement of its facets, and so forth. An Extremely Thick girdle may add to the overall weight (and therefore price) of the diamond, and make the diamond look smaller, without adding any benefit as far as clarity, color, or cut. Regardless of how large or small your diamond is, when it comes to girdle width, a Thin to Medium diamond is best. Even large cremation diamonds benefit from a Thin to Medium girdle width because this width is ideal for setting in jewelry and for making the diamond look beautiful and well-proportioned. Both diameter and cut can also influence how large or small your big diamond appears. Carat-weight and girdle thickness are not the only factors that affect how large your diamond looks. Two diamonds with equal carat-weights and girdle thicknesses can still look different from each other, based on other factors. The two most important of these factors are (1 Their diameter and (2 Their cut. Diameter refers to how long across the diamond is. In diamonds that are not round, the diameter is expressed as a ratio of the length by the width. This ratio determines how fat, or large, the diamond appears. For example, a 1-carat heart-cut diamond could have a ratio of 6.5mm x 6.5mm or a ratio of 6.15mm x 6.80 mm. The second diamond will appear fatter than the first thanks to its greater width. When it comes to large cremation diamonds, the important thing to remember is that the right diameter is a matter of personal preference. You should choose the look that you prefer for your big diamond. Cut refers to the shape of the diamond when it is formed from a rough diamond into a polished stone ready to be placed in jewelry. There are numerous cuts available from which to choose. The most common are the brilliant cut (round), cushion cut, asscher cut, emerald cut, princess cut, oval cut, marquise cut, pear cut, radiant cut (square) and heart cut. Each of these cuts will affect the perceived size of a large diamond. Certain cuts can make your diamond look even larger. The fancy cut diamonds tend to leave the largest amount of surface area on the diamond and, therefore, make your diamond look larger than do large round brilliant cut diamonds. When dealing with a large cremation diamond, it is less important to maximize the perceived size of the diamond than it would be if you were dealing with a small diamond. As a result, you should choose the cut that you prefer overall. Balancing the look, significance, and perceived size of a cut will help you make the best decision regarding how to have your big diamond cut. The classic diamond is a white diamond. This beautiful, colorless gem is often promoted as the ideal type of diamond. However, when you purchase a cremation diamond, you can choose from among five different colors: White, orange-yellow (also called a cognac diamond), yellow-green, blue, and red. Each of these colors can hide imperfections or create a more eye-catching look. For example, a large red diamond, a yellow diamond, a blue diamond, or an orange diamond might hide slight flaws that would otherwise be more visible in a large brilliant cut in white, making your gem even more beautiful. In addition, a colored diamond can make your gem stand out in whatever jewelry setting you use. For example, a large round brilliant cut diamond in red, or a large round brilliant cut diamond in blue will boast a richness and uniqueness that will catch the attention of everyone who looks at your jewelry. When considering a big memorial diamond, you have every reason to feel confident in the beauty of the gem you are about to buy. With the right girdle thickness, the right diameter, the right cut, and the right color, you can create a lasting and ideal memorial to your loved one.